his paper provides best practices to control and protect the distribution of Personally Identifiable Information (PII) via email and electronic documents. 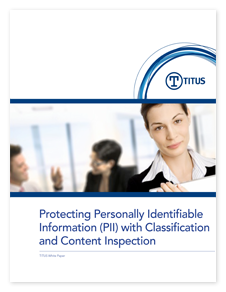 Discover how data classification can protect PII. Uncover how 3 different industries (Financial, Healthcare & Military/Government) are using data classification to secure PII from getting into the wrong hands.